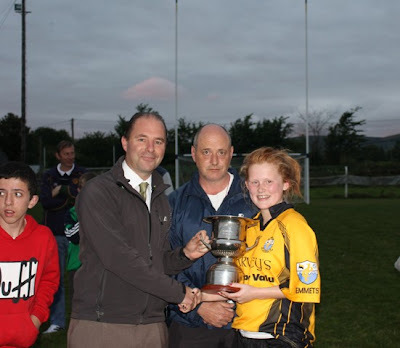 Emmets captured the Kellihers Toyota Tralee U16 Division 1 County title defeating Chorca Duibhne at Ballymac last night in which Savannagh McCarthy excelled. This victory came to Emmets after 3 final losses in previous years and a new rivalry was sparked as Chorca Duibhne pushed them all the way to the end, in a game that swung back and forth right up to the final whistle. to a goal again when she pick up a ball on the half way and made her way towards the Chorca Duibhne goal and chipped over a delightful point. The West Kerry sides response was immediate and when a high ball ended in the Listowel square Kavanagh was quick to volley to the net to level the final 4-7 each with the clock ticking. The side traded a brace of points each and were still level heading into injury time. 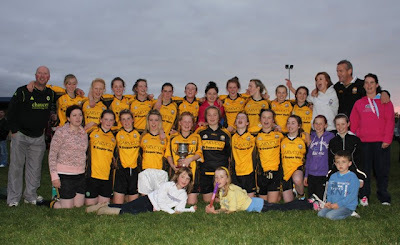 However in the dying moments Emmets called on their experience and when Aoife Shine tapped over a point it was beginning to slip from the west Kerry girls and the loudest cheer of the night was reserved for Megan O’Connor’s point that put daylight between the teams again with no time for a reply. This was a tremedously fought game with two good teams giving it their all. Emmets victory was won in all sectors of the field but the display given by Savannagh McCarthy (1-7) and Rebecca Horgan (2-1) was second to none.